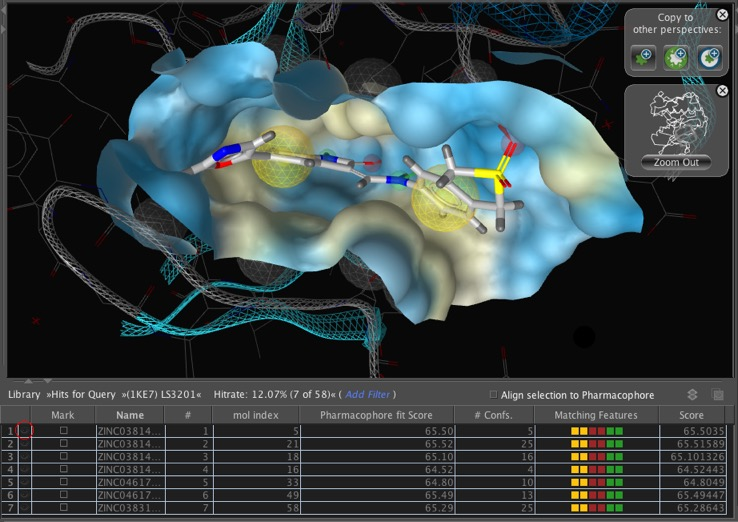 Ligandscout now supports deriving pharmacophores based on known active ligands rather than relying on a PDB structure. LigandScout used to rely on external applications to run the actual virtual screening such as Moe, Catalyst or Phase. The latest version now allows you to undertake the virtual screening within LigandScout. 3. LigandScout now has an interface to Omega from OpenEye. Omega is a blindingly fast conformation generator that has proved to be very succesful at reproducing bioactive conformations. 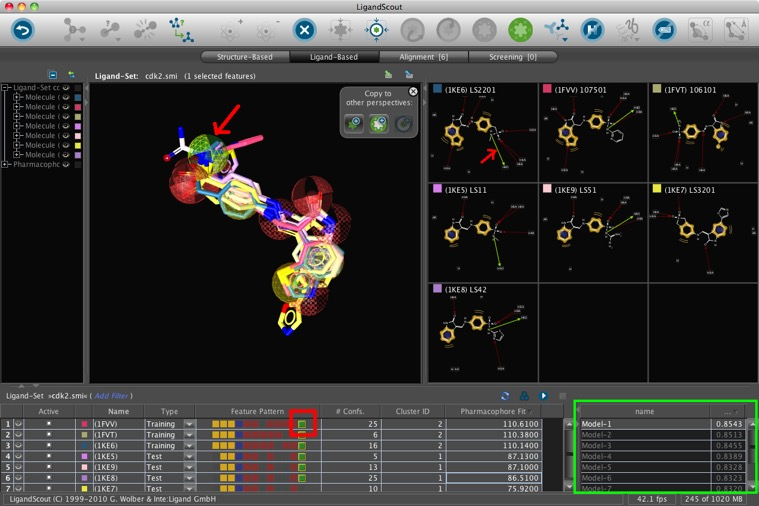 Omega is very rapid (1-2 sec/molecule), systematic and rule-based conformer search • Converts from 1D or 2D to 3D using distance bounds methods • Diverse ensemble selection based on RMS distance and strain energy • User-configurable search resolution • Automatic superposition of structural features • Distributed processing via PVM for most Unix platforms. The version of Omega that comea with LigandScout is restricted with respect to exporting capabilities (only ldb format), however if users have their own licensed version of Omega they can use that instead. 4. iWorker, if users install the software on multiple machines then iWorker can be configured to run jobs on remote machines. Each iWorker can run multiple tasks in parallel and take advantage of multiple core machines. Once the iWorker gets a task it is executed and the results returned to Ligandscout. This has the potential to be a huge benefit since you can mix Linux, Mac, and PC for parallelization over a network. One of the appealing features of LigandScout is the ability to simply type in a PDB code and use the automatic interpretation of the PDB file create the protein structure and highlight the ligand. I tried a range of proteins including those containing co-factors and multiple ligands and in every case LigandScout performed flawlessly. In the last review I described creating a pharmacophore for searching a MOE database, one of the nice features is the ability to overlay and merge pharmacophoes derived from different ligands for the same molecular target. With the merged pharmacophores it is then possible to select the most important elements for pharmacophore searching. Whilst is still possible to export the pharmacophore queries in Moe, Catalyst or Phase format it is now possible to undertake the search within LigandScout using a database of compounds in .ldb format. One advantage is the results are imported directly into LigandScout at the end of the search for analysis. If very few hits are obtained it might be worth reducing the number of required pharmacophoric features. The graphics are superb and by adding a surface to the protein you can really get a good feel for how the ligand fits into the binding site, the surface can be colour coded based on lipophilicity, HBD/A, or charge. The results can be sorted by simply clicking on the column headers, each hit can be displayed individually by selecting the “eye” symbol highlighted by the red circle. By selecting a number of hits it is possible to browse through each hit and examine each conformation, the best fit is shown first. Whilst a number of scoring functions are available it does not appear possible to invoke any external scoring functions. One nice feature is that when you exit the program you have the option to store the results, it would be nice if it was possible to store a log file for use in an electronic notebook. One of the new features is the ability to generate pharmacophores based solely on the ligand which is obviously critical if no information is available about the protein. The first step is to read in the set of ligands, these can be in a wide variety of chemical file formats including SMILES strings, LigandScout uses OMEGA to generate a range of 3D conformations. Each structure is individually colour coded and you can examine each structure by turning off the display of the other structures using the “eye” icon. 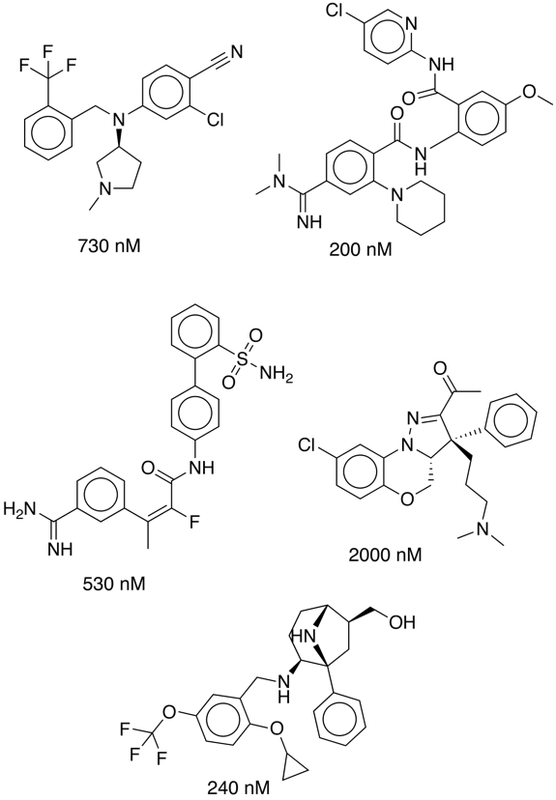 In a couple of mouse clicks you can create a ligand-based pharmacophore, this takes a few minutes depending on the size of the ligand set and the number of conformations generated, the results are shown below. As shown by the table in the lower right-hand corner highlighted by green box. 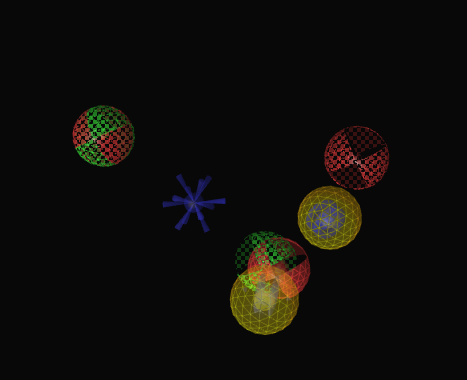 A series of models are created and you can examine each model individually, the overlaid structures and pharmacophores are shown in the main window. The table at the bottom now has the pharmacophoric features annotated, and if you click on a pharmacophoric element (red square) the corresponding feature is highlighted both in the main window but also in each of the individual molecule displays (red arrows). 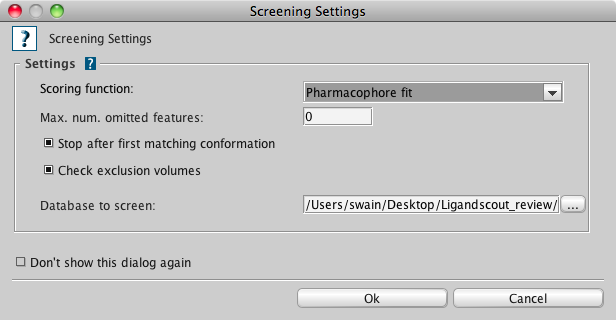 The generated pharmacophore can be edited and then copied across to the screening view for virtual screening. Creating a Screening Database The databases that LigandScout uses for internal virtual screening can be created using a command-line tool called ibgen. At it’s simplest the ibgen uses the default values assigned to OMEGA and merely requires the user to choose input and out files. Licensed to: Chris Swain, Cambridge Medchem Consulting. This is a relatively time-consuming operation but one that only needs to be done once. The resulting databases are quiet large, the size of the databases is approximately 750 MB per 100k compounds, (assuming a maximum of 25 conformers per molecule, and a typical screening compound size). Creation of the database is an ideal task for distributed computing and if users install the software on multiple machines then iWorker can be configured to run jobs on remote machines. Each iWorker can run multiple tasks in parallel and take advantage of multiple core machines. Once the iWorker gets a task it is executed and the results returned to Ligandscout. This has the potential to be a huge benefit since you can mix Linux, Mac, and PC for parallelization over a network. The iWorker GUI provides a number of configuration options, if you have a multi-processor machine you can limit the number of parallel tasks to ensure not all the CPU capacity is utilised. 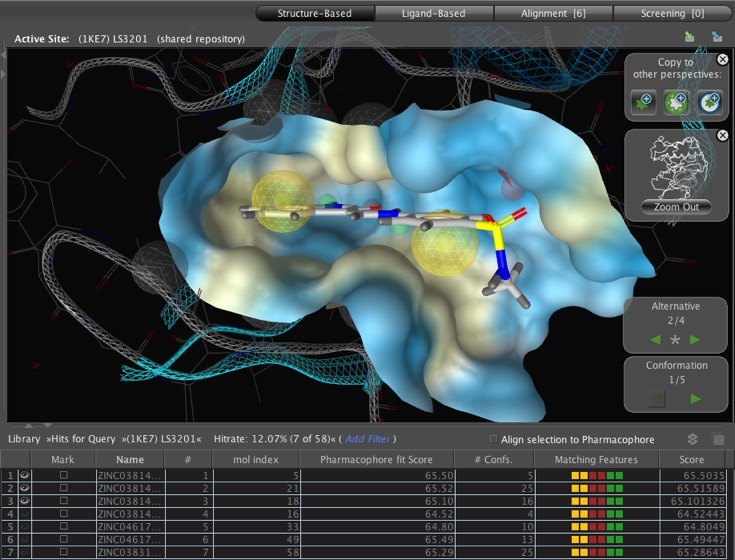 The databases are indexed with pharmacophore features and there is a first filtering step in the virtual screening procedure that removes compounds that have no chance to map the query pharmacophore. Searching large databases is time-consuming. HERG Pharmacophore In recent years, a number of drugs have been withdrawn from the market because of reports of sudden cardiac death. In all cases, long QT syndrome an abnormality of cardiac muscle repolarization that is characterized by the prolongation of the QT interval in the electrocardiogram, was implicated as inducing ventricular tachycardia that can spontaneously degenerate to ventricular fibrillation and cause sudden death. Virtually every case of a prolonged duration of cardiac action potential related to drug exposure can be traced to one specific mechanism: blockade of IKr current in the heart and blockade of Kv11.1 potassium ion channel encoded by the hERG gene (KCNH2) is widely regarded as the predominant cause of drug-induced QT prolongation. There is more information here. 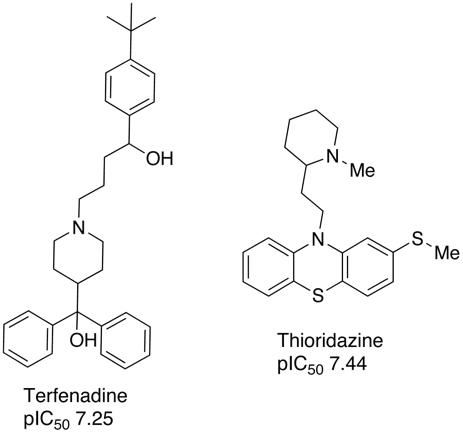 Two known ligands are Terfenadine and Thioridazine. 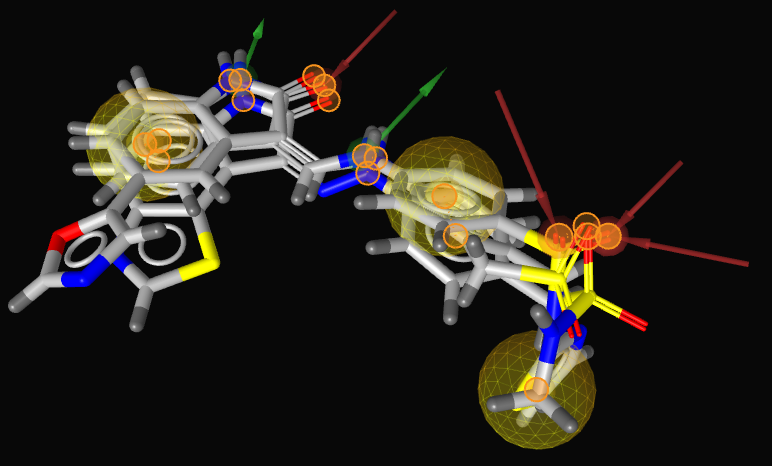 The 2D structures were imported in mol2 format and then ligand-based pharmacophores generated, using OMEGA used to generate 3D conformations. The overlaid structures and pharmacophores are shown below, one of the nice features is you can interrogate the pharmacophore, selecting a feature in the left-hand panel, highlights the corresponding feature in the pharmacophore overlay and the feature pattern. I then used this to search a database of compounds which I knew contained HERG active compounds, some of the hits are shown below. LigandScout has taken a significant leap forward with this update. 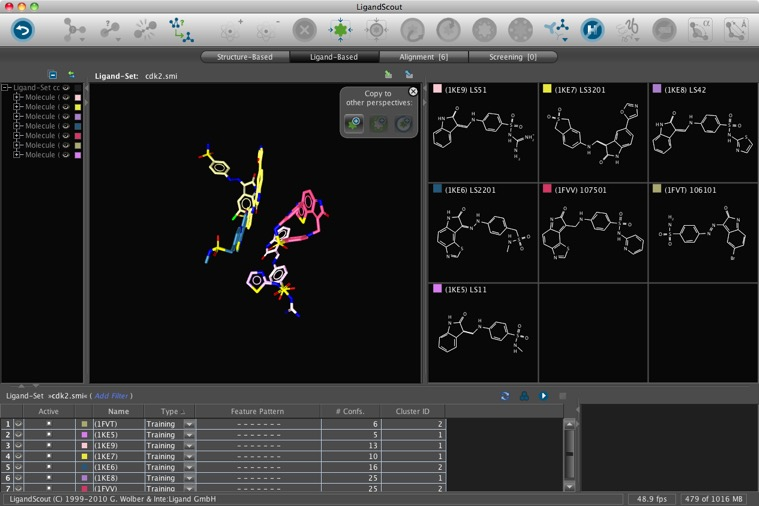 The introduction of support for ligand-based pharmacophore generation, together with the capability to undertake the virtual screen within LigandScout, whilst maintaining the user friendly interface and workflow are major additions. The use of OMEGA from OpenEye for conformation generation is a sensible use of an established tool, with the collaboration with OpenEye in place perhaps it would be worth looking at including shape matching using ROCS? The move towards distributed computing using iWorker is likely to be a very attractive feature.